Blooms are a porous mass of iron and slag resulting from the smelting of Iron Ore in a Bloomery. The output from a bloomery is a Raw Iron Bloom. 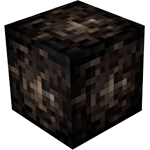 The Raw Iron Bloom will have a percentage value of its iron content, where each percent is equal to a single unit of metal (100 units of ore will result in a 100% bloom, enough for a single Wrought Iron ingot). Note: If enough ore wasn't initially added to the bloomery, and it results in a bloom that is less than 100%, it cannot be refined and must instead be thrown back into the bloomery with more ore to make it larger. WARNING: When bringing a Raw Iron Bloom up to working temperature, be careful not to let it melt or the Bloom will be lost. Raw Iron Bloom >= 100% Refine Refined Iron Bloom Work on at least a Tier 2 anvil. 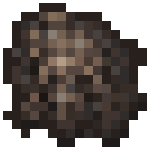 Raw iron blooms that are less than 100% cannot be refined, and must be thrown back into the bloomery with more ore to create a larger bloom. Refined Iron Bloom 200% Split Refined Iron Bloom 100% x2 Only needed for blooms over 100%. If starting bloom isn't a multiple of 100%, it will split into as many 100% blooms as possible as well as a single bloom with the remaining %. For example: A 360% bloom will split into 3 100% blooms and a single 60% bloom. Refined Iron Bloom < 100% Melt Unshaped Wrought Iron Melt refined iron bloom into wrought iron in the forge with a ceramic mold in the side slot, or in a crucible. Melting refined iron blooms under 100% in the forge will give partial unshaped ingots, which can be combined if both are at liquid temperature by using the casting interface, or by using a crucible. WARNING: Melting a refined iron bloom over 100% in the forge will result in only 1 unshaped ingot. Any excess metal will be lost. See the Bloomery for more details. This page was last modified on 12 March 2015, at 23:46.